I have a review of a product I recently tried from the beauty brand "Scunci". scünci® (pronounced skuncee) was built on entrepreneurial spirit powered by innovative thinking. Long respected as the leader in fashion hair accessories, scünci® operated as a privately held company until its acquisition in March of 2005 by Conair Corporation, a worldwide leader in professional and consumer hair appliances. They have a wide range of so many interesting pretty hair goodies. The item I'm taking about today is called "Design Weaver". Its really neat little tool for your hair, to help make pretty & cute styles. 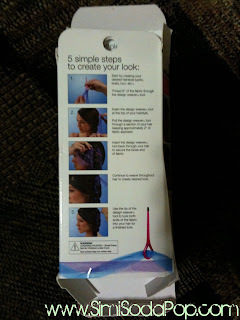 It says.. "Make a statement by weaving fabric through any hairstyle." It works best with somewhat longer hair. All you do is attach it at the top of your hairstyle and like braid it through your hair. It's a really cool design and it makes a nice a bold statement, and I have had lots of compliments while wearing it, girls all want to know.. "Wow that's so pretty, what is the name of it & where did you buy it?" The little kit includes four lightweight, colored scarves designed to be woven through the hair. To use the design weaver kit, style your hair, and then thread the fabric through the design weaver threading tool (included) and insert it into a section of your hair, leaving about two inches of fabric exposed. Insert the tool back through the hair to secure the loose end of fabric, then continue to weave the rest of the fabric through your hairstyle to create your own, customized look. It's great for updos, braids, buns, and more, it’s a great way to add that cool “something different” to your style. A great look that I love with this Design weaver is a side fishtail braid, and I wore it to a friends birthday party & everyone loved it including the birthday girl, she loved it & wanted one for herself! The scünci design weaver is available for around $4.99 at many beauty areas of large retail stores. Check it out at your local stores while on your next beauty shopping trip! I'm excited to try out more items from "Scunci"! 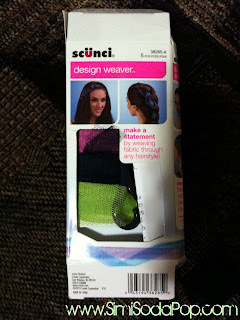 The company sent me the "Scuni Design Weaver" for a possible review.